A good night’s sleep is essential to function well every day. When we don’t sleep well we wake up sore and achy, feeling unrested and not adequately refreshed. It’s all downhill from there. When your day doesn’t start off well it can be hard to have the stamina and patience to tackle whatever is on your agenda. My husband and I have a great mattress set, one of those fancy memory foam ones. But, we still like the comfortable feel of a good mattress topper. It’s just a personal preference. 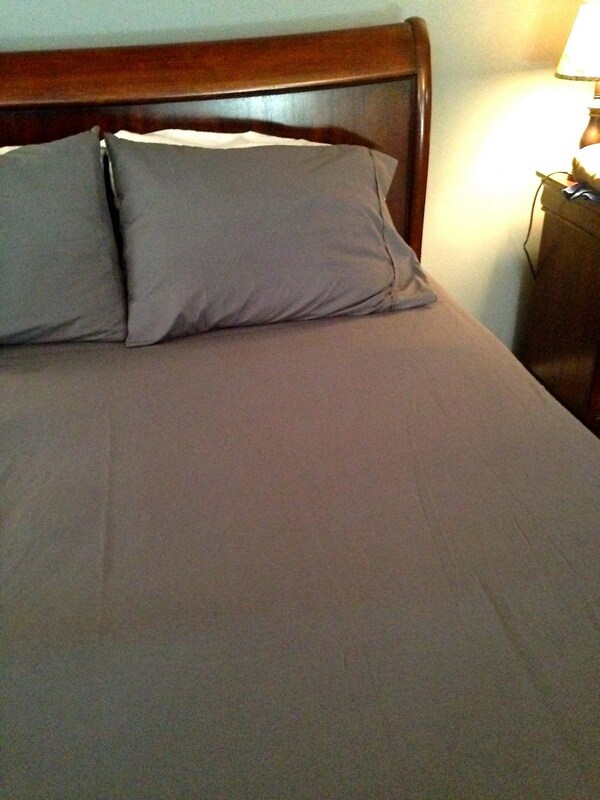 It was time to get a new one, as the one we’d had for about the last four years was getting noticeably worn and I wasn’t always getting the greatest night’s sleep on it. I’m not sure what I did, but a few months ago I pulled something in my upper back, somewhere right between my neck and left shoulder blade. It was incredibly painful and was slow to heal. While moving (and ibuprofen) helped during the day, I always seemed to wake up each morning in agonizing pain. I decided to give the Airweave Top Mattress a try to see if making this small change might help me get better, more restful and comfortable sleep. So, I requested one and waited for it to ship. Here’s what the shipping package looked like upon arrival. 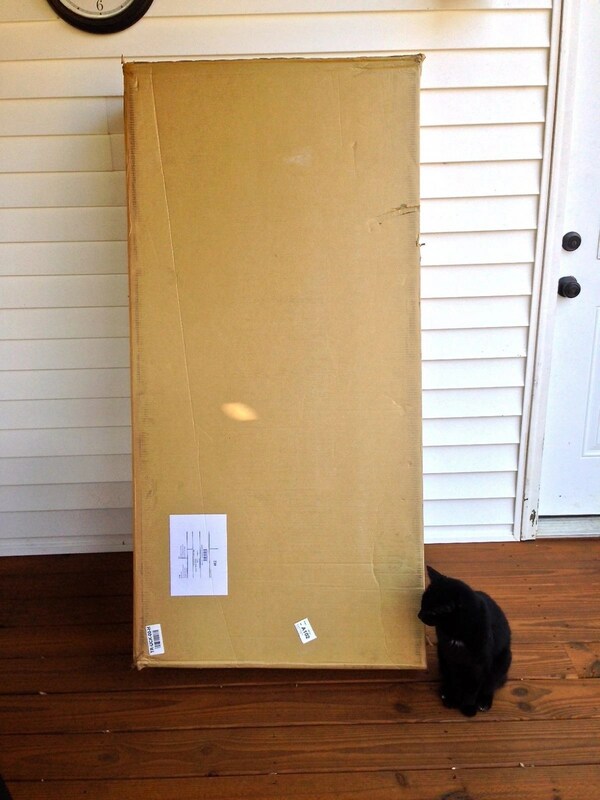 The mattress was folded from the top to the bottom in thirds inside the slim shipping box. I was pretty easily able to grab a hold of it by myself and get it upstairs to my bedroom. That’s my cat, CoCo, there checking out what I received. She was interested enough to follow me through the house to my room and watch me open the box and then lay in the box afterward. Cats are so funny! Airweave mattress toppers are a Japanese innovation that strive to provide the ultimate comfort and support to promote a restful night’s sleep. 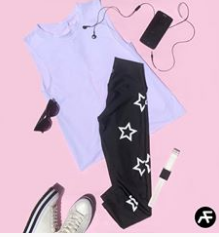 Their products are designed with a patented flexible airfiber core to adjust to your every movement while also allowing your body weight and moisture to disburse. This design encourages airflow to regulate body temperature throughout the night. It’s also easy to clean. 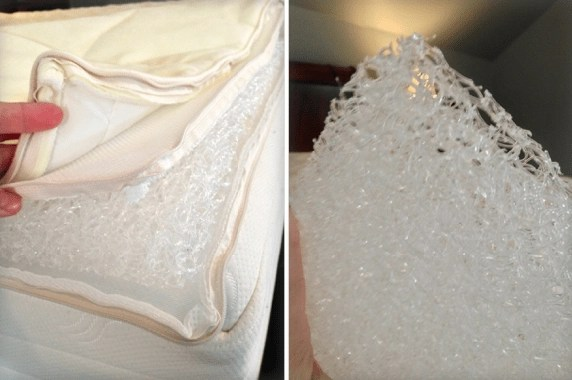 This is one of the downsides of other mattress toppers which can be rather bulky and difficult to launder. 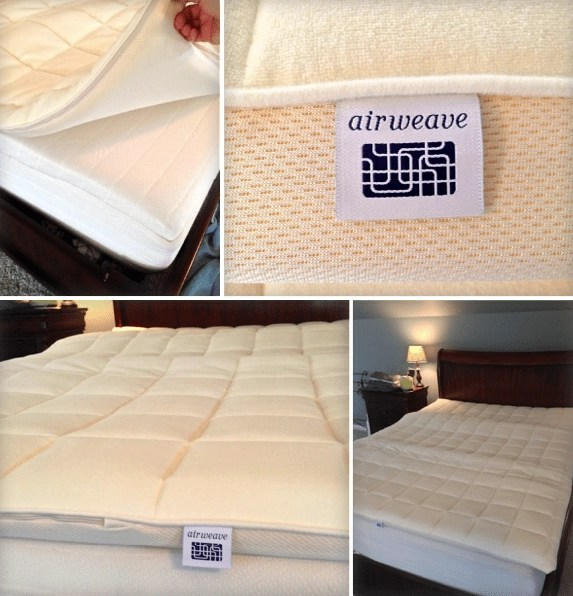 With Airweave you simply remove the outer and inner mattress covers and machine wash. The inner airfiber core can be rinsed with water and allowed to air dry. Simple as that! 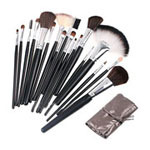 Another thing I want to mention is the eco-friendly aspect of this product. The plastic airfiber core is totally recyclable! Yes, if you ever want to get rid of the mattress topper you can recycle it. That’s a far cry from other toppers (my old one included) that end up in landfills. Pictured here is my old mattress topper. I wanna say the hubby and I picked this up at Target on sale several years ago for around $60. It has been a great comfortable topper, but I have been noticing it losing some of its shape and sometimes I don’t feel very supported by it at night anymore. Time for it to go. While I love the topper itself, it is a bit thick and can make getting some sheet sets on the bed a bit difficult. 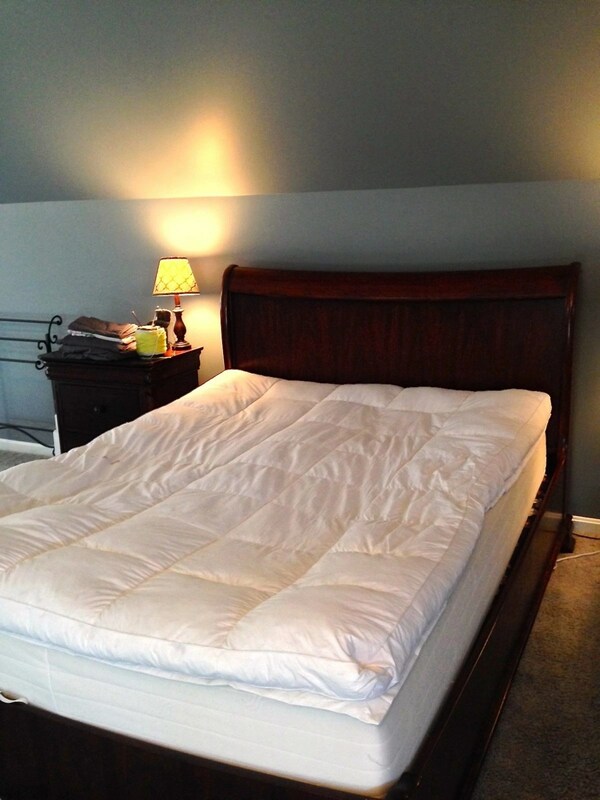 I was pretty excited that the Airweave Mattress Topper is thinner (measuring only 1.8″) than my old one for this reason, I could only hope it made laying down to sleep feel as much like heaven as this old one had! 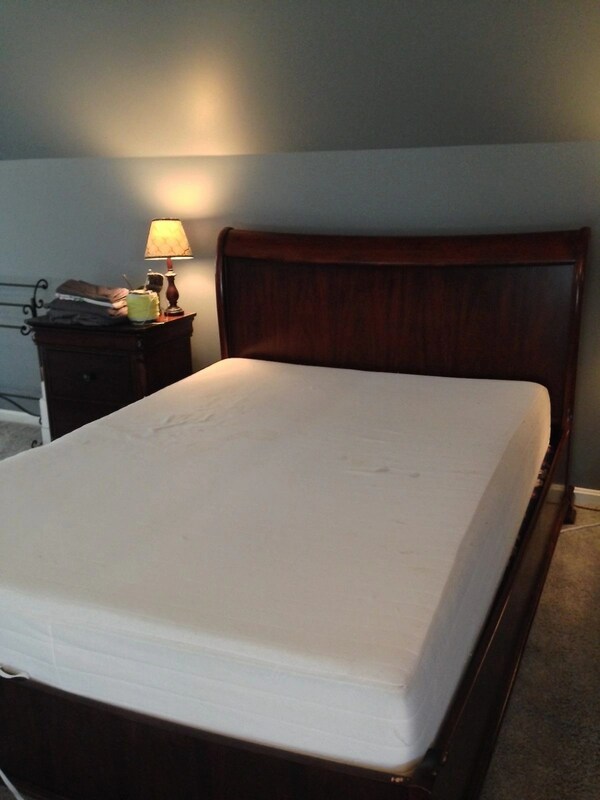 Here’s the mattress without a topper at all on it…it looks pretty naked! And, finally, here it is with the new Airweave Mattress Topper in place. It is just a tad wider than our mattress, but with the sheets on it stays in place just fine. 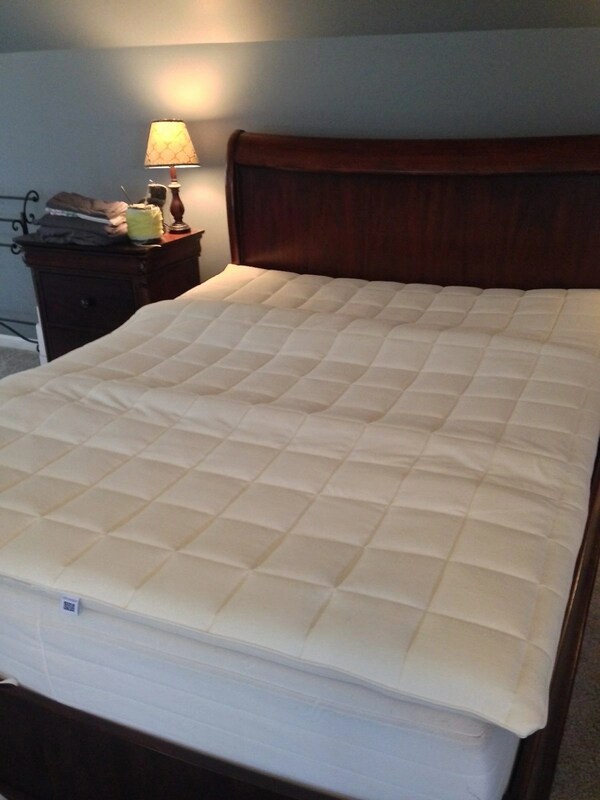 It took a few nights for me to get used to this new mattress topper simply because it wasn’t as fluffy as my old one. It molded to the contours of my body, though in a less pronounced way than the old topper because it feels just a bit firmer. I’ve heard that it can take a few weeks to adjust to a mattress topper change so I decided to give it at least a few weeks and then see what I thought of it. I was really shocked that after about a week I realized that the agonizing pain that I’d had when waking up every day from that shoulder injury was all but gone! I’ve heard that sleeping on this mattress topper feels like sleeping on air and I have to say that I completely agree. I’m not prepared to make a claim that this (or any other) mattress topper can cure pain, but I truly believe that it helped me! It has helped others, too, and can be found in some very fine hotels around the world. It’s also used my many athletes. In fact, the company has partnered with the U.S. Olympic Committee as the official mattress pad supplier for Olympic athletes. 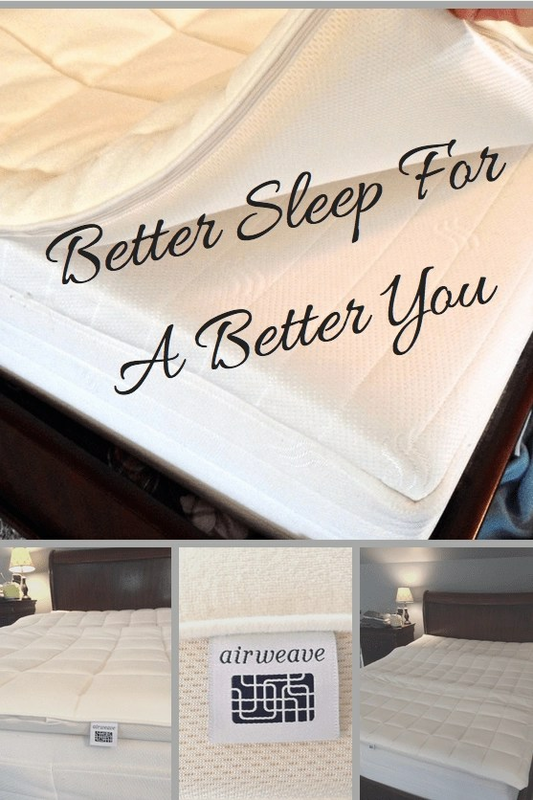 I’m getting the best sleep of my life right now with our Airweave Top Mattress, and I absolutely LOVE how easy it is to take care of and clean. Are you ready to replace your mattress topper, yet?